Bridge of Hope Children’s Ministry began a child sponsorship programme in May 2009 in order to support children who live in severe poverty. Although we are not currently expanding the sponsorship programme there are 150 vulnerable children receiving care and shelter with a local guardian or family member across the district of Rukungiri in South West Uganda with support from our child sponsorship scheme. Every child that is considered for sponsorship is visited at home to enable our staff to gain a full understanding of the child’s life and the circumstances they are living in. This enables us to be sure we are reaching the very poorest children in the community. Once a child is registered into the Bridge of Hope Child Sponsorship Programme we then seek to link them to an individual sponsor in the UK. Every sponsored child of school age will attend school as their fees, uniform and school resources are paid from the sponsors monthly giving. Each child receives a mattress and blanket and once we know the family well they are given a goat to help them to generate an income. 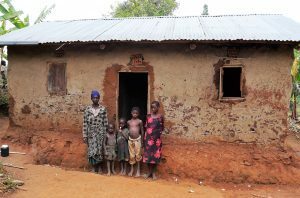 This ensures that the whole family benefit from the sponsorship and is highly effective in reducing poverty. Because the Bridge of Hope Child Sponsorship Programme covers a large geographical area, the sponsored children and their guardians meet monthly in three different zone. Here they receive personal guidance from our manager and dedicated staff, advice on nutrition, hygiene, and Bible teaching together with practical support to improve their lives. Home visits by our staff are regularly conducted to ensure that full support is given to families. Many of the guardians have requested a Bible in their local language as they cannot afford to buy a copy and we are always pleased to provide God’s Word. We are delighted to say that many of our sponsored children have now graduated to Secondary School or Vocational Training; this would simply not have been possible without the support of their sponsor. 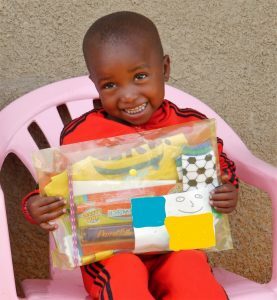 Once a year sponsors send a small gift/parcel and a letter to their sponsored child. These gifts and letters are taken to the projects by Trustees from the UK to ensure their safe arrival. Sponsors then receive a letter and photo from their sponsored child which allows them develop a personal relationship and see the difference their sponsorship makes. Furthermore, letters, regular support and prayers encourage the children and their guardian’s to develop a full and meaningful relationship with God. We are a Christian charity reaching out to the very poorest children in the community.